But then his wife found another man. From there, Ryan’s life quickly fell apart. He had one problem after another, until finally he went to prison for selling stolen cars. Home from prison at last, he took a new job – still breaking the law – and returned to prison for a few more years. 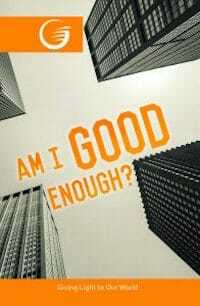 Have you ever felt that you were never good enough? Maybe one or both of your parents made you feel that way. Maybe it was the students at school. Or your teachers. It might have been your boss. Or all of the above. But somehow you just knew that you didn’t meet the expectations of the important people in your life, people whose love and respect you most wanted and needed. And if you weren’t good enough for them, how could you EVER hope to be good enough for God? Martin Luther felt that way, too. The beliefs and superstitions of his religion filled him with fear of God as a cruel dictator, a harsh judge. As a young man, he constantly feared that he would upset or offend God. The more he read the Bible, the more guilty he felt. He tried hard to find pardon and peace by fasting, studying day and night, beating himself, until at last his health was gone and he still felt only guilt and despair. In one last effort to find freedom from his sins, Luther began to climb “Pilate’s staircase” on his knees. Suddenly he heard a loud voice saying, “The just shall live by faith” – there is nothing you can DO to save yourself. The idea that man can save himself by his own works is at the foundation of every false religion. God does not require us to do some dreadful, difficult thing in order to have the forgiveness of sin. We don’t need to make long, tiring pilgrimages or perform painful penance to gain His forgiveness. Romans 3:20 says that no person can be declared righteous and forgiven, except by faith. Every effort to live a righteous, holy life through our own strength is doomed to failure. The Bible says that there is NO ONE who is righteous, no not even one. For ALL have sinned and come short of the glory of God – every person in the world (Romans 3:10, 23)! Then is your case hopeless? Is mine? You might think you have been too bad for God to love. But even if you may have been very sinful, the worse you are, the more you need Jesus. And there is only one “unpardonable sin” – only one sin that God will not forgive (Matthew 12:31). It is to stubbornly refuse throughout your life to accept God’s invitation to repent and let His Holy Spirit work in your life. If we deliberately choose to continue sinning, there is no sacrifice, nothing that we can do, that will cover our sins (Hebrews 10:26). But He has promised that if we confess our sins to Him, He is faithful and just – completely fair – to forgive us from sin and to cleanse us from all unrighteousness (1 John 1:9). Whoever tries to hide his sins will not prosper, but whoever confesses and gives them up, will receive God’s mercy (Proverbs 28:13). Christ said that everyone who has sinned is “a slave of sin”. Sin does produce guilt. And guilt can be a very heavy load to carry, damaging its victim not only spiritually and emotionally but even physically and mentally. But the cure – the antidote – for guilt is forgiveness, which gives a clear conscience and peace of mind. Christ has assured us, “If the Son – Jesus Christ – makes you free, you shall be free indeed” (John 8:36). Don’t think that you can ever be “good enough.” Only Christ can be. Yet God still expects us to be righteous, holy, obedient to His law. But by ourselves we aren’t even capable of totally obeying God in every thought and word and action. It is only through His power, by His Holy Spirit, that our lives can ever be changed. As we trust God completely, as we daily search for His will in our lives, we will desire to do what He wants. It is by faith – by complete trust in Jesus Christ and His death on the cross for your sins – that God, the Father and Judge of all mankind, accepts Christ’s righteousness in place of your failure. Then God’s love treats you and loves you as He loves His own Son, Jesus. Satan wants to destroy your faith and your hope so that you will give up on God. Satan wants you to believe that you are too bad for God to save, that your case is hopeless, that you have been too bad for God to love you and forgive you. Satan may make you believe that you cannot come to God until you have made yourself good enough. But we may answer Satan’s accusations with God’s promise that “whoever comes to Me, I will in no way cast out” (John 6:37). Tell the enemy that Christ’s blood shed on the cross cleanses from all sin. If you take even one step toward God in repentance, He is listening, waiting eagerly for you to give your life to Him. Jesus loves to have us come to Him just as we are, sinful, helpless, dependent. We may come with all our weakness, our foolishness, our sinfulness, and fall at His feet in repentance. He wants to encircle us in His love, to heal our wounded lives, and to clean us from all sin. It is true that God hates sin, but He loves each and every sinner. He sent Jesus to our world so that EVERY person who would choose to accept His love and forgiveness could experience the peace and joy that comes with freedom from guilt. You may, like the apostle Paul, say, “Jesus Christ came to save sinners, of whom I am chief.” Yet Christ would have died for even one sinner. John 3:16 assures us that God loved the world so much that whoever believes in Him will not perish (die eternally) but will have everlasting life.